As soon as summer ends, the hype for Halloween exponentially grows. Spooky decorations don’t just adorn brick and mortar stores, but the spirit of Halloween becomes ever-present within the digital app stores as well. 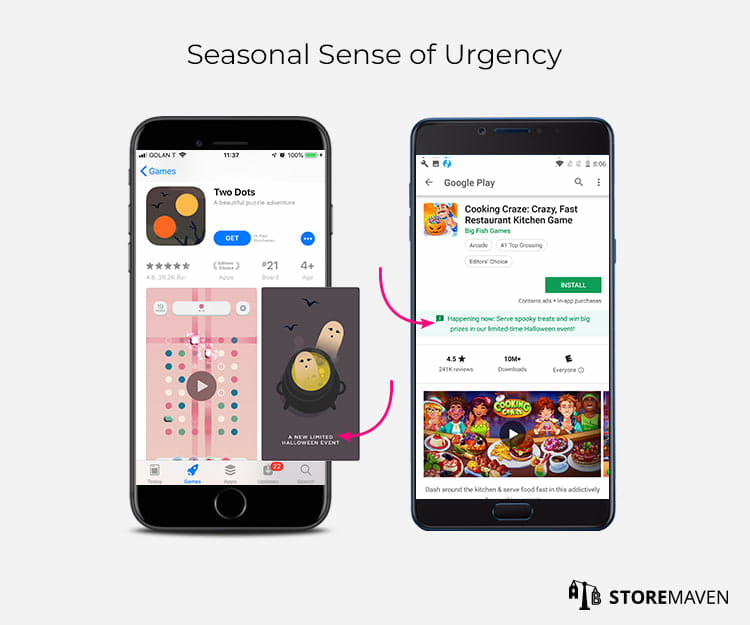 With this holiday comes the question of seasonality in general and its impact (positive or negative) on your app or game’s conversion on both the Apple App Store and Google Play Store. Should you invest design resources into updating your Icon or Screenshots with holiday branding? 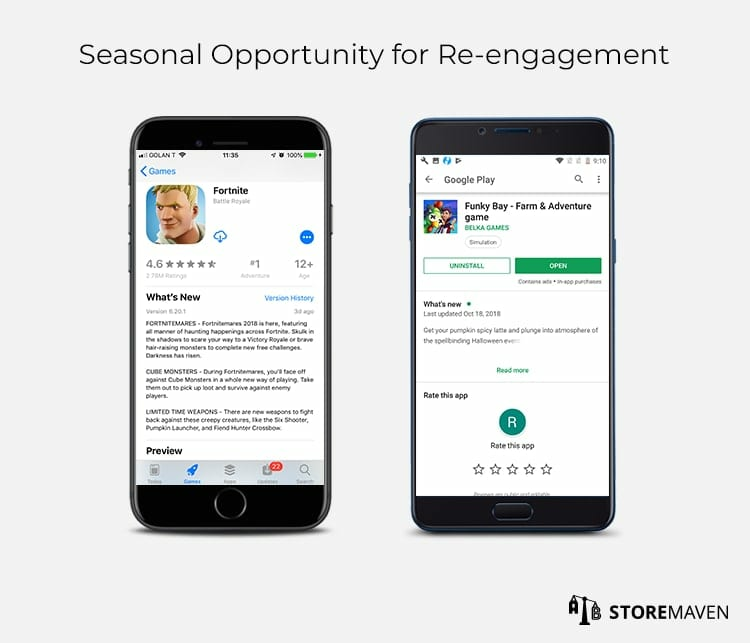 How will your conversion and re-engagement be affected if you incorporate special holiday features and/or gameplay directly into your app’s functionality? What are other companies in your category doing? Based on our analyses, seasonal app store optimization (ASO) can vary in its impact. It can be great for re-engagement to excite existing users about something new, but can also harm conversion if visitors’ expectations for special themed updates aren’t met. Even though you can no longer optimize for Halloween specifically, this post uses Halloween to unpack different seasonal strategies and their implications so you can make a more informed decision on your own seasonal marketing activity throughout the year (especially with Christmas coming up!). 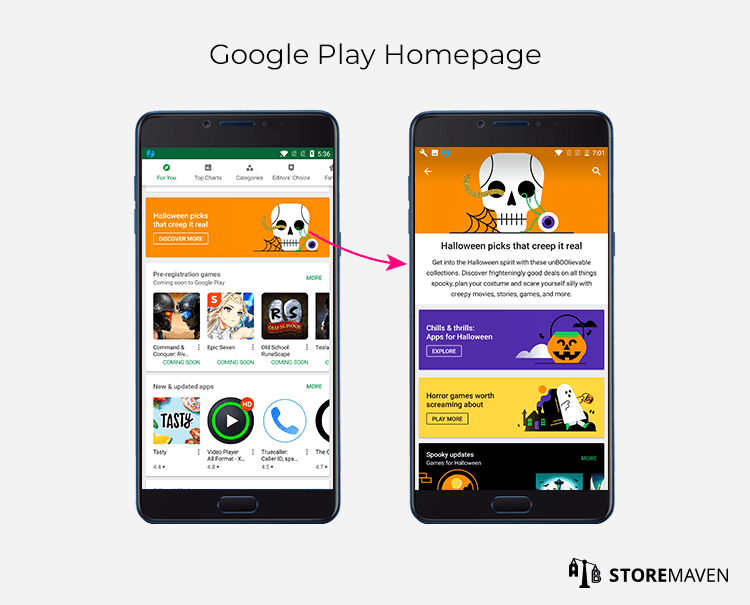 As you browse through the App Store or Google Play, you’ll notice that many developers implement Halloween-themed app store creatives, which can encourage visitors to click through to the Product Page in the hopes of seeing a unique in-app feature related to the holiday. However, this high engagement can quickly decrease if the remaining app store creatives aren’t consistent with the Halloween theme and there’s no special Halloween addition to the app or game. In fact, we’ve found that although visitors are spending more time exploring your Product Page, they eventually drop once they see the contradiction and realize there’s no app or game update. In the examples above, both Icons communicate a Halloween theme, but the games haven’t been updated with any unique Halloween features. If visitors only see that only an Icon has changed, it’s often ignored as just a gimmick, and it won’t drive conversion. To bring it into the real world, it’s like decorating your store for a specific holiday without offering a special holiday collection. You’ve clearly advertised for this event, but there’s no unique, themed pieces once people walk in. This can only lead to disappointment once they realize their expectations haven’t been met. It’s quite common for apps and games to tailor features or add characters that relate to specific holidays. For this reason, app store browsers are more actively searching for themed apps and games in the days or weeks leading up to major holidays. Gamers, specifically, are accustomed to experiencing new storylines, unlocking new characters, or seeing new environments designed to emulate different holidays. And with nearly half of all installs being reinstalls, this opens the opportunity to use seasonal creatives to boost re-engagement metrics among existing or lapsed users. 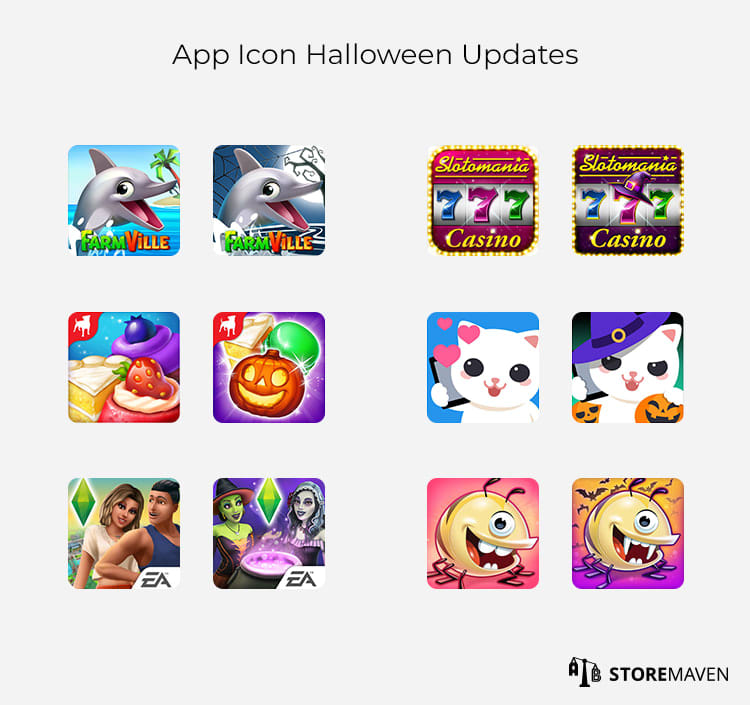 First of all, existing users with auto-update enabled will notice a new, Halloween-branded Icon on their device home screens, thus sparking interest to check what’s new and to explore the new app experience or gameplay. For lapsed users who go back to the app stores, they’ll now be exposed to special What’s New copy in both the Apple App Store and Google Play Store. The What’s New text typically appears below the fold on the App Store and within the expanded description on Google Play. However, it’s listed directly under the header for returning installers, thus giving it much more prominence on the page and creating a more significant impact on these types of users. In the examples above, Fortnite clearly highlights their “Fortnitemares” update that features Halloween-themed weapons and new Cube Monster characters, and Funky Bay promotes their new Halloween Island environment. Developers often use this section to showcase basic updates (and there are different strategies behind this text), but holidays like Halloween are unique in that visitors to the page are more engaged and actively looking for special updates. This is a great opportunity to promote unique holiday-specific features to encourage visitors to re-open or re -install your app/game and experience something new. But, what about new users? If you’ve spent time adding unique Halloween storylines, characters, events, or features within your app or game, you should make sure it’s clear in your Product Page, specifically within the Gallery assets. A majority of your visitors will be exposed to your Gallery as soon as they land on your Product Page, and this is where they will look to get an accurate representation of your app/game functionality. If you only describe your Halloween update in the What’s New section, you will miss the opportunity to convert new visitors who make a decision to install or drop based on assets they see above the fold (what we call Decisive Visitors). In the example above, only visitors who choose to explore and expand the “Read more” section will learn about Funky Bay’s new Halloween event. In comparison, Game Face AR designed Screenshots that specifically showcase their unique Halloween content. This ensures that visitors immediately see the app has been updated to focus on Halloween. Additionally, you can use your app store creatives to create a sense of urgency that can further impact conversion. Halloween is a single-day holiday; once it’s over, it’s over. Highlighting the “limited time” nature of these special holiday elements is effective in encouraging visitors to download your app and take advantage of the new features before they’re gone. Lastly, you have an opportunity to leverage the holiday hype throughout your entire funnel. 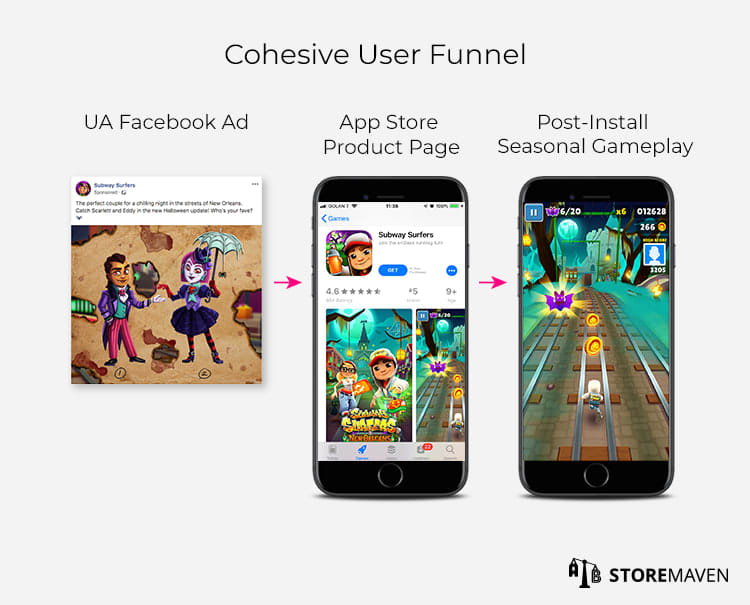 Subway Surfers is a great example of a game maximizing the impact of seasonal creatives throughout the user journey. 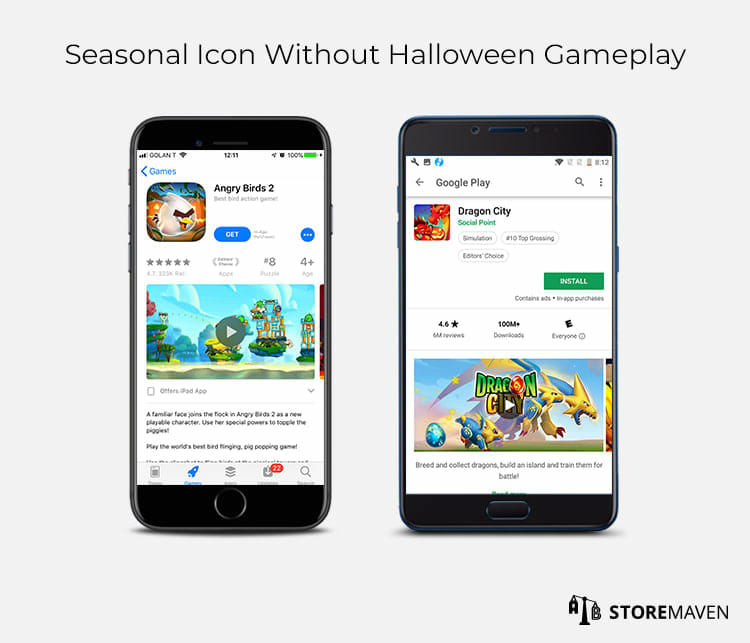 They reference a Halloween update in their user acquisition (UA) ads, incorporate Halloween-themed creatives in the Gallery on their Product Page, and have a Halloween environment within the game itself. There’s cohesion in every step, which ensures that visitors’ expectations are fully met, and they come into the Product Page with much higher intent. Throughout different holiday seasons, both app stores dedicate space on their navigation pages to special editorials and featured listings for holiday-related apps. They want to remain current with the times and clearly give preference to apps and games that showcase something special for different holidays. For this reason, beyond just impacting conversion directly on your Product Page, designing seasonal creatives gives you a much higher chance of being featured by Apple or Google. This provides you with the coveted opportunity to vastly increase impressions and installs from visitors browsing the various app store homepages, navigation tabs, and top charts. 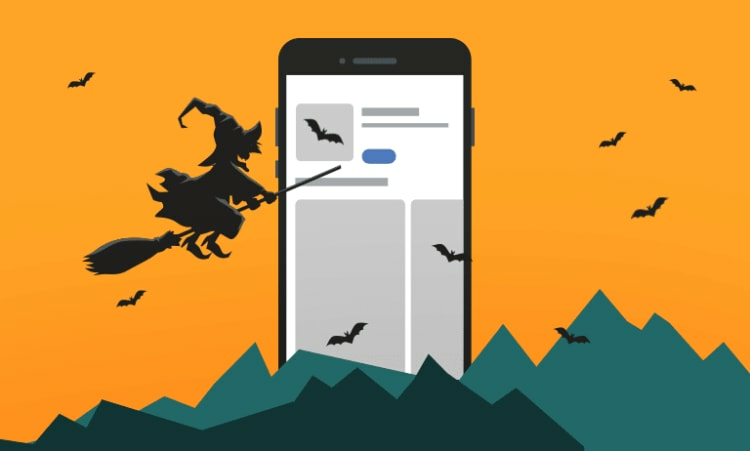 For Halloween, Google aggregated a variety of Halloween-themed apps into different categories and within content-rich editors’ pieces, making it easy for visitors to discover apps with special Halloween updates. 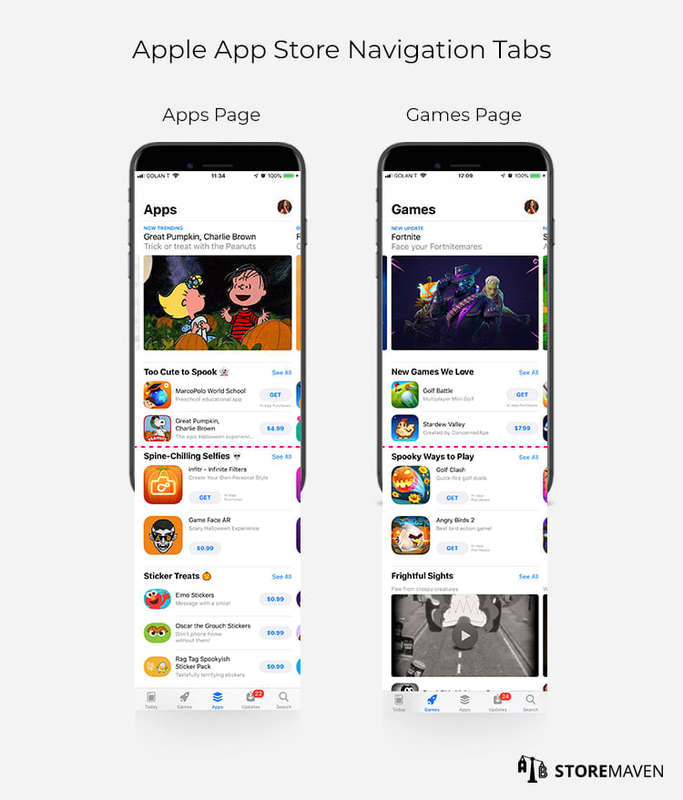 On Apple’s Games and Apps tabs, they created entirely new categories—such as “Spooky Ways to Play” and “Spine-Chilling Selfies”—to showcase Halloween-related apps. We tracked a variety of changes that some of the leading developers made to their app store pages prior to Halloween, which provides unique insight into how other companies optimize for seasonal holidays. The changes range from subtle design additions to the Icon to more substantial changes that affect the First Impression Frame (everything above the fold). When designing your own seasonal creatives, you should consider how aggressive you want to be. As you can see in the examples above, many of the Icon changes represent more subtle updates that, on their own, won’t have a large effect on conversion. They are effective in initially capturing attention with Halloween design elements, but it doesn’t necessarily mean this will lead to higher conversion. To amplify the impact, though, the developers could consider complementing the Icon with Gallery assets that also showcase in-app Halloween content. We’ve also found that more noticeable design changes can increase exploration (e.g., scrolling through the Gallery, expanding the Short Description, etcetera) of your Product Page. Visitors are more willing to spend additional time trying to understand what content is new and whether the limited-time holiday specials are worth the download. However, significant redesigns to showcase holiday content can also be more risky. 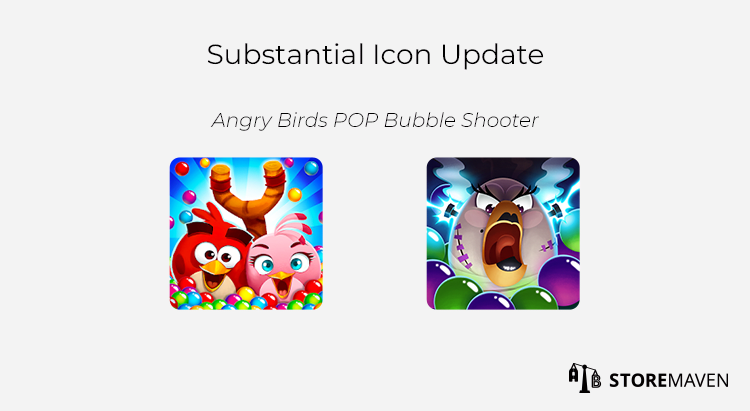 For example, the Icon for Angry Birds POP Bubble Shooter was significantly redesigned for Halloween, so it would be crucial to track whether visitors still understood the premise of the game and were convinced to install. If you stray too far from the core functionality of your app or game in order to showcase Halloween-themed creatives, you can possibly alienate potential installers who aren’t interested in a Halloween theme or who won’t fully understand your true product. Alternatively, if you make notable design changes, but the app/game itself doesn’t actually incorporate any in-app Halloween-related features, you can also lose potential installers to disappointment at the lack of special content (similar to what we described in the first section). The key is to strike the right balance. 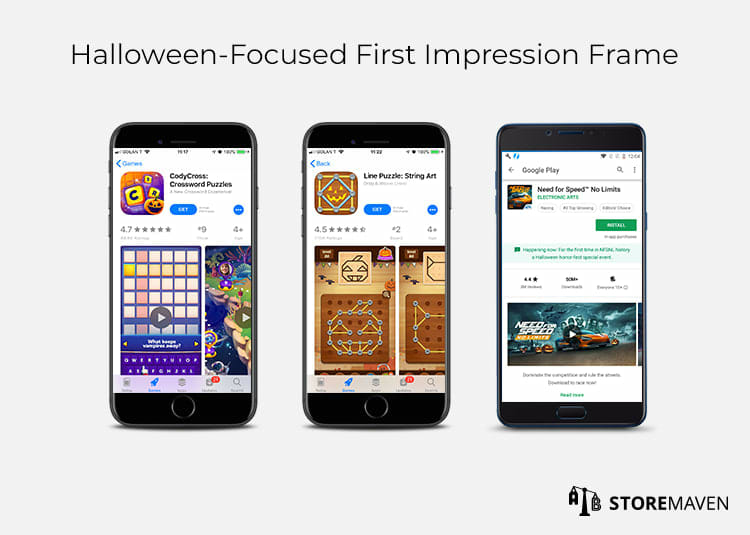 To take it a step further, the above games completely redesigned their First Impression Frames (specifically the Galleries) to more effectively highlight the unique in-app gameplay they implemented for Halloween. The consistency in holiday messaging throughout the page will most likely have a positive impact on conversion from high-intent users coming to their app store pages looking for special content. To stay on top of the seasonal activity other companies in your category are conducting, we recommend using Mobile Action, App Annie, or the ASO Tool Box Chrome extension. 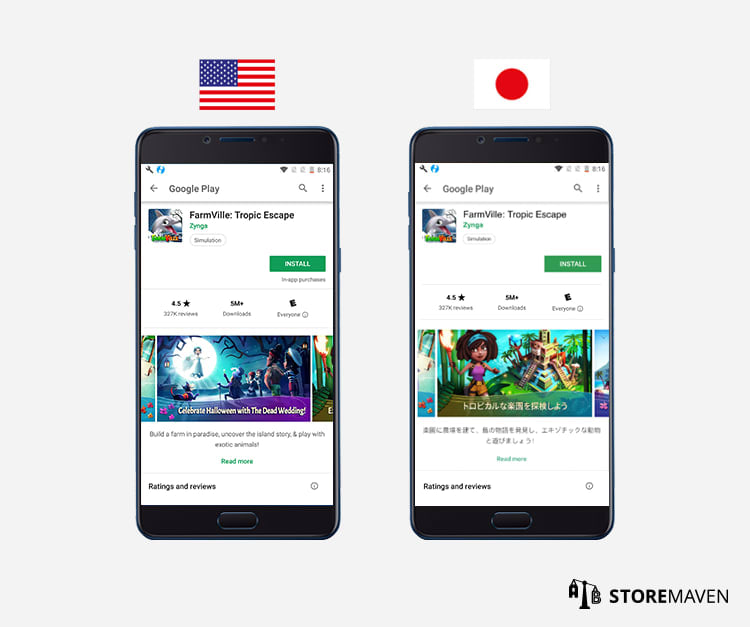 Since the App Store and Google Play Store are available in hundreds of countries around the world, it’s important to keep app store localization and culturalization in mind. Not all holidays are global, so you should conduct extensive research and understand your various markets (and their subtle cultural differences) before promoting a specific holiday on your Product Page. As you can see in the example above, the United States version of FarmVille: Tropic Escape includes a dedicated Screenshot highlighting the special Halloween storyline. In their Japan store, this specific Screenshot is left out of the Gallery since Halloween is not a major holiday for the Japanese market. These regional differences are important to consider when pushing seasonal creatives to ensure you don’t offend or confuse your various markets. No matter the extent to which you redesign your app store creatives to focus on a specific holiday, you should still track the impact they have on your overall performance. Perhaps you find that adding seasonal creatives doesn’t make an impact (good or bad) on your conversion or re-engagement. Or alternatively, you discovered that incorporating a Halloween Icon without updating the gameplay to match led to a severe decrease in installs. Regardless of the results, you need to analyze the data and uncover these valuable insights in order to determine where to focus your resources and efforts for future seasonal holidays. This also opens up the opportunity to test the value of seasonality in smaller markets first instead of waiting for the next major US holiday. Halloween is Over. What Now? Although it’s too late to leverage the hype from Halloween, each of the topics we discussed above are important factors to consider when coming up with your overall seasonal app store strategy. This is especially relevant now since Christmas is approaching, and you should have already begun preparing and strategizing for it. Also, it’s important to be aware that not every app or game lends itself to being optimized for the holiday season. You should stay true to the core aspect of your app/game and to your brand, and not feel pressured to do so just because other developers have. App store testing is one way to remove some of the guesswork and determine if it would be an effective marketing tactic. 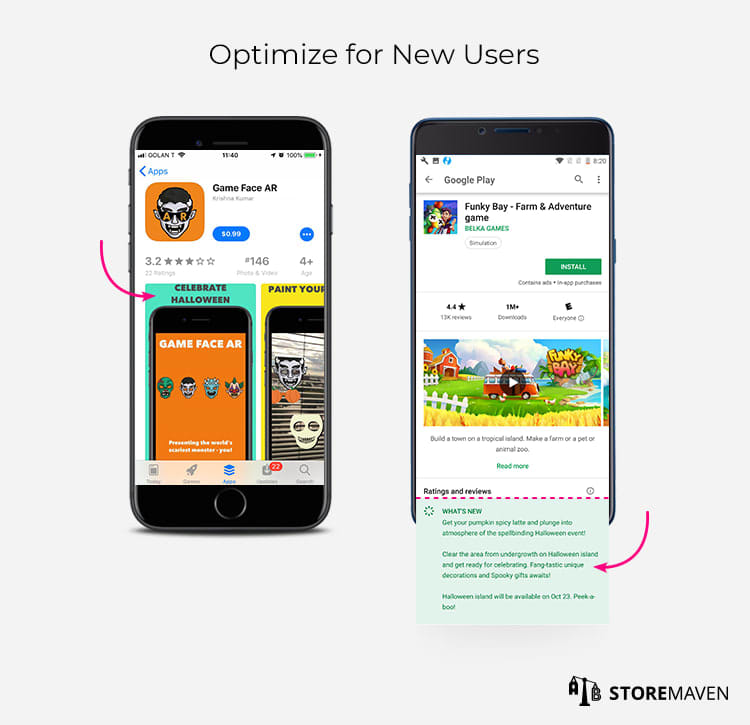 StoreMaven is the leading ASO platform that helps global mobile publishers like Google, Zynga, and Uber test their App Store and Google Play creative assets and understand visitor behavior. If you’re interested in seasonal testing or would like help testing your current app store creatives, schedule a demo with us.